Nikki knew Damon Vessler would not let his prized creation go easily---she simply never imagined the lengths he'd go to get her back into his clutches, and turn Nikki's heart toward darkness. A Seeker at her heels, trained on her blood, Nikki flees with Raven alongside her for protection, while Mace and the other Halflings fight the battle that has erupted on earth. But even as the two boys she loves fight for her, she knows the battle will be hers to win. Determined to uncover the secrets of her past, and exactly how she fits into Vessler's twisted plans, Nikki sets off on her own, and soon discovers facing hellacious beasts is nothing compared to the decision she will need to make. One that could change not only the war, and her relationship with Mace and Raven, but her future with the Throne. 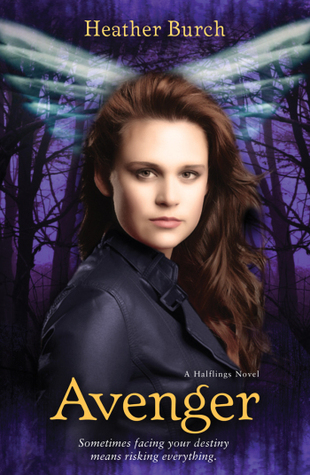 Avenger is the third book in the Halflings series by Heather Burch. If you haven't read any of this series, it is dealing with nephilim and those that love them (that sounds like the makings of a soap opera. Avenger has fixed pretty much everything I didn't like about Halflings. I thought that books one and two had an odd progression- in book one, Nikki didn't need anyone and was pretty self-reliant. In book two, we find Nikki as a complete opposite. Nikki is weepy, needy, and dependent on everyone around her (and makes a ton of stupid mistakes). In book three, Nikki seems to be a better balanced character. She is tough and still cares an incredible amount about the people around her. Whether that is because it is a natural progression for that character to make through the storyline or a direct change from the author, I am not positive. Either way, it was for the better. This book reminds me a lot of the Embrace series by Jessica Shirvington. Not because they are copycatting each other- I am not saying that at all. Both books are high in romance and high in action and drama. They both have to do with angels and the fight against evil. I really love the relationships in this book. All the relationships in this book really shine. I love how all the characters interact with each other and have grown together throughout the books. Avenger is the continuation to a series that only gets stronger with each book. This is the end of the series (but also not the end- sorry spoilers!) I have enjoyed reading about Nikki's journey and can't wait to read more from this author. Its my favorite too. :) Thanks for the review!! !